The sorting has begun! We have transported all our frozen goods and I’ve been cooking up a storm with the things that wouldn’t survive the trip, starting with our blueberries! We have been fortunate enough to not only live just around the corner from an organic blueberry farm, but also to have a neighbour who grows blueberries in our very own back garden – every time he has picked them we have been spoilt with at least an ice cream container full!! We’ve been enjoying them on our cereal or in porridge in the mornings, in baking and desserts, but there were so many left we just couldn’t have eaten them all before our move in less than 2 weeks time, so I decided to turn them into jam. This was my first attempt at making jam and it was surprisingly easy. The result is delicious (especially with that guilty splash of cointreau in there!). I doubled the recipe and it made about 6 jars full – enough to give away to family and friends and keep some for ourselves. 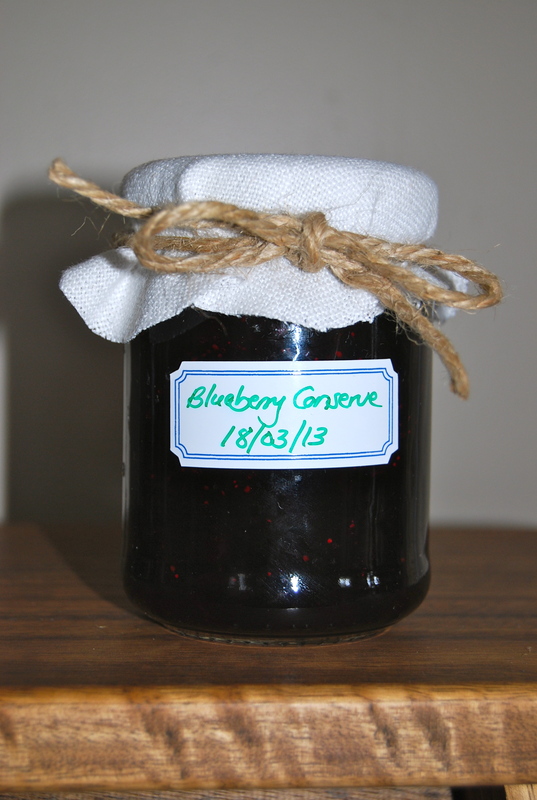 Note, this is quite a runny jam, more like a conserve, as the recipe doesn’t require pectin. Place the blueberries, sugar, Cointreau and lemon juice in a large saucepan over medium-high heat. Bring to the boil. Use a large metal spoon to skim any froth from the surface (you may need to do this a few times throughout cooking). Reduce heat to medium-low. Simmer, stirring often for approx. 35 minutes or until the jam jells when tested. Spoon the hot jam into clean, steralised, hot jars. Seal. Invert for 2 minutes. Set aside to cool. ← March = Moving Madness! !